Hair Loss - Why Does It Occur ? The normal cycle of hair growth lasts for 2 to 3 years. Each hair grows approximately 1 centimeter per month during this phase. About 90 percent of the hair on your scalp is growing at any given time. About 10 percent of the hair on your scalp, at any given time, is in a resting phase. After 3 to 4 months, the resting hair falls out and new hair starts to grow in its place. However, some people may experience excessive (more than normal) hair loss. 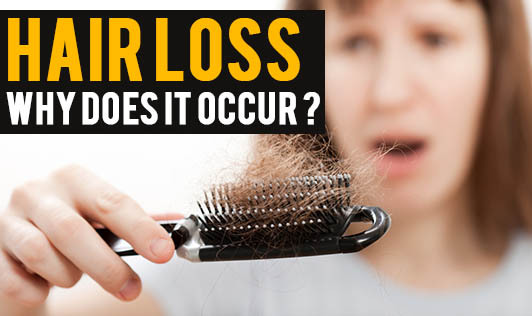 Hair loss may lead to baldness when the rate of shedding exceeds the rate of re- growth. Poor nutrition: Having inadequate protein or iron or zinc in your diet or poor nourishment in other ways can cause you to experience hair loss. Fad diets, crash diets and certain illnesses, such as eating disorders, can cause poor nutrition. Styling: Shampooing, blow drying and brushing your hair often can cause a few strands of hair to fall out. In case of excess hair fall, consult a dermatologist for the proper guidance. Medical treatments: Undergoing chemotherapy or radiation therapy may cause hair loss. After your treatment ends, your hair typically begins to re-grow. Hereditary hair loss: Genetic hair loss isn't due to excessive amounts of hair falling out, as many believe, but due to an insufficient amount of hair growing back to replace the hair that have been shed. Hereditary baldness is associated with factors like gender, age and hormones. Hormonal changes: Hormonal changes and imbalances can cause temporary hair loss. This could be due to stress, pregnancy, childbirth, discontinuation of birth control pills, the onset of menopause, or an overactive or underactive thyroid gland. Correcting hormonal imbalances may reduce hair loss. Scalp infection: Infections, such as ringworm, can invade the hair and skin of your scalp, leading to hair loss. Once infections are treated, hair generally grows back. Ringworm, a fungal infection, can usually be treated with a topical or oral antifungal medication. Consult a dermatologist for appropriate treatment.